On 4th August 1914 Britain declared war on Germany. 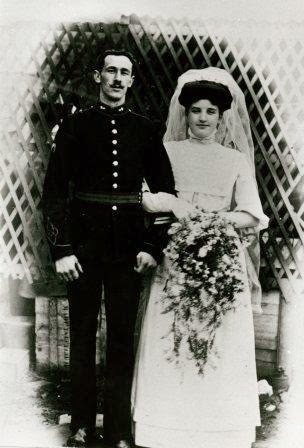 The following day, my great-grandfather, Farrier Sergeant James Joseph Creighton was mobilized to active service. 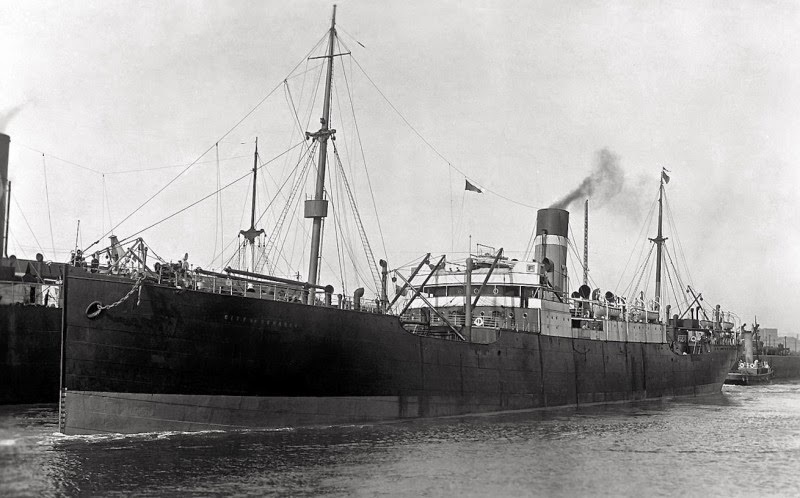 He left Cork docks with his "destination unknown." He travelled via England on a long and arduous journey to the Western Front in France near the border with Belgium. From August 5th to October 22nd, his 28th birthday, he kept "notes." These neat but spare pencil jottings describe his journey from Cork to France, writing the bare essentials of what he saw and experienced during the opening months of the First World War. The reason the diary ends rather abruptly, according to my grandmother, is because he was told to stop writing by one of his commanding officers for fear it might fall into enemy hands and cause harm. Although his notes are short, they create a concise and perceptive record using a language which is very clear. The diary (measuring 90mm x 60mm x 4mm) is very fragile, and, in part because of this, a few years ago I decided to transcribe it; I then made up copies of the transcription, complete with photographs of each page, so that the diary could be shared by everyone in our family. James Joseph Creighton survived the Great War. 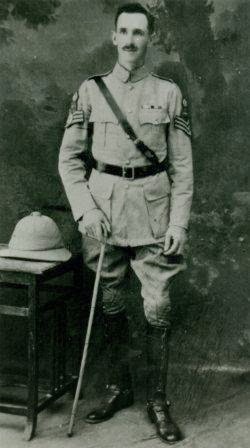 He had served in the Army since the age of 18, and once the War was over he was stationed in India between 1919 and 1923. 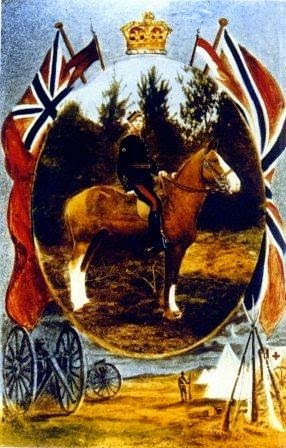 When he eventually left the Army he continued to work as a farrier and had an expert knowledge with regard to horses. He wrote another larger and more detailed notebook, illustrated with sketches and diagrams, detailing how to nurse and care for injured or unhealthy horses. We also have a cine film reel of him shoeing a horse in his forge. 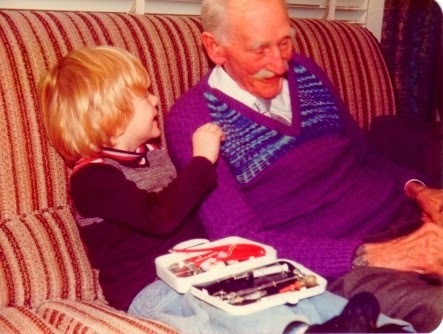 Although I was still only very young at the time I have very vivid memories of my great-grandfather. He was a very kind and gentle man with large warm hands and a large white Edwardian moustache. Born in 1886, an Irishman from Banbridge in County Down, he died in 1984 when I was 8 years old. 24th Brigade R.F.A. mobilized [...] active Service, 5th August 1914. Embarked Cork docks, 18th Aug. Destination unknown. Arrived Cambridge, England, 2am, 21st Aug. Remainder of 6th Division on the way. Entrained 8th Sept. Arrived Southampton 4pm, same day. Embarked on ‘The City of Benaires’ Arrived Saint Nazaire, France, 11th Sept. Had a nice voyage. Corporal of 110th Battery fell overboard while disembarking horses. Had narrow escape. […] Entrained 3am, 12th Sept, St. Nazaire. Detrained at Maarle 8am, 13th Sept. Lecture by O.C. Marched 25 kilometres camped for the night. Wet through to the skin. Horses standing over the fetlocks in mud. Had a very miserable night. 14th Sept. off again, done 30 kilometres. Guns booming in the distance. Did not bother about the names of these places. Bivouacked again for the night at Paars, near the River Aisne. 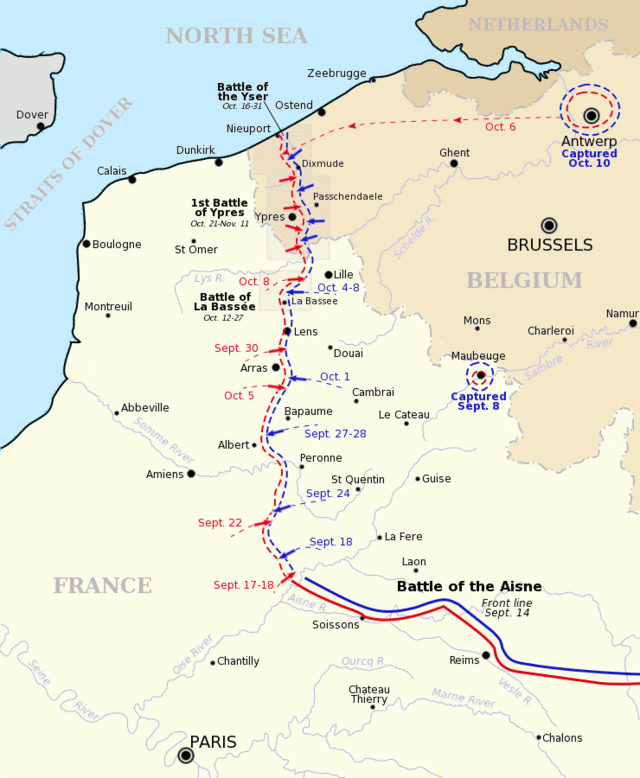 15th Sept. got into a bit of a billet, resting ready for the final Battle of the Aisne. Wounded going down from the fighting line in dozens to the hospitals. Gunners entrenching & making gun pits. One Gunner killed & Lieutenant Eyse 112th Battery wounded, Gunners name Rutherford, by a German Coal box / shed nicknamed by the troops. 29th Sept. Germans retiring to Belgium. British forces to move […]nto left wing from left centre. March by night, keep under cover by day. Entrained at small station South of the River Ouse. Passed through Crepy St Dennis. 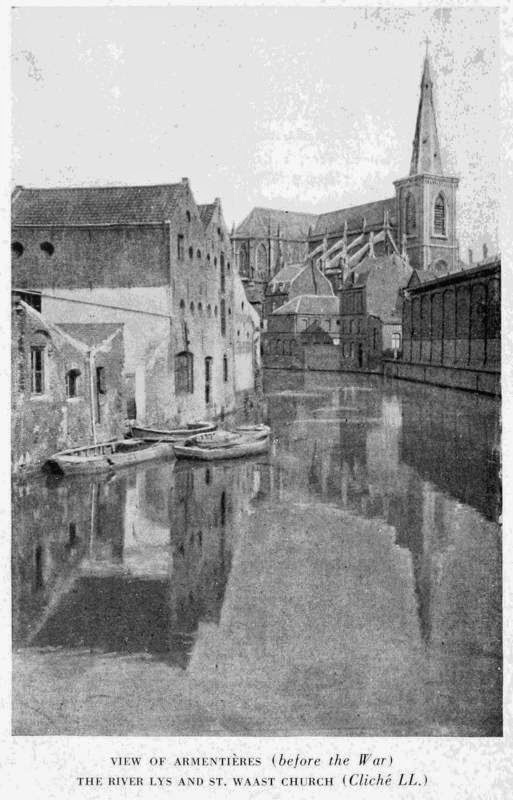 St Just Amiens Abbeville. Stopped one day [...] night in Saint Ormans. Marched about four miles. Guns booming. Came into action 1.30pm. 13th October. Fired 172 rpounds. Guns remain in action all night. Been raining hard all day, wet through. Village on fire in the distance. Enemy retiring at day break. Ordered to advance passed two houses on fire in village by German shell, also grave of Private Piper L.N.S. killed in action last night. Billeted for the night. 15th Oct. Lay down tired out. Germans took two boys belonging to people of billet. Used them to dig their trenches. Women weeping everywhere. Church on fire. Moved off about 10am, passed German dead Trooper, shot through the head. 11 others buried on roadside. They were a German Cavalry patrol caught by a patrol of the Royal Fusiliers. One in cottage dieing. More dead horses. Their horses well shod for frosty weather. But it would take them longer to put [...] the screws than it would for to rough our horses. Entered the town of Stumurecl[? ], just on Belgian frontier. Town turned upside down. Off again 7pm. Keeping them on the go. Very cold. After an hours march we halt on roadside. Two hay stacks on fire. They think we are going to walk between them & show ourselves up. But no. We remain in the darkness all night. Myself, G M.S & Davy huddle behind a hay stack, try to have a nap but cannot for the cold. Two bridges taken by Liensters during the night. Only 1 killed 9[?] wounded. Camped again for a few hours sleep. 16th Oct. off again. Once more arrived at some town also turned upside down. Women again weeping in doorways. Most of them crying with joy at seeing our troops. They know they are safe when we enter a town or village. 7 Germans just brought in. One spy shot. 17th Oct. off again. Just passed 30 dead horses. German Cavalry. Just halted. Bivouac. Oct 18th arrive at Chappe Le Armantiers. Came into action on left of church. Shells flying on. One hit. Three shells burst between 110th wagon line. Very narrow escape for horses & Drivers. G.M.S. & myself watch them going into the church in dozens. Then the fire is directed into dwelling houses. Smashed to bits. Germans start sweeping. Cannot shift find our guns but find our wagon but may have to shift it. Oct 19th firing continues all night. Sure to be heavy casualties. Mr Leach wounded but performed a gallant act. 1pm shells bursting all around us. Just slightly windy. 6pm wind up. Enemy supposed to be advancing. Harness up. Be ready to move off at a moments notice. Every one in suspense. We do not like retirements. 9pm all quiet. Gen sends down. This position to be held at all costs. 11pm. Enemy drove back. Awful slaughters to the Germans & Prisoners taken. All quiet 6am. Oct 20th more shells. 1 Cpl 43 Battery killed. The roar of guns is awful. You can hear it roaring off for miles. Heavy firing all day. No casualties. Our guns are well concealed. Oct 21st. guns at it again. As G.M.S & myself were having dinner of boiled peas & Bully one came whizzing over our heads. We lay flat on the ground. Then we set to dig ourselves in. 22nd Oct. My birthday. What a night we had last night. The heavens were alight with Rifle & Artillery fire. The Germans attacked us. Three army Corps to the 6[? ]th Div. Never will I forget it. They attacked us at about 11pm. But our orders were to hold that position at all costs. The Germans are lying in hundreds dead. R.B. killed 80, captured 100. Our casualties amounted to 6 wounded. This morning they did not repeat this attack, but keep shelling us. They have had enough of British doggedness. The spire of this church on my right is just about to topple over. * As I write the ground is shaking with the bursting of their heavy shells, but doing no damage to our troops. Absolute waste of ammunition. We drove them back after one hours terrific fighting. Lord but it was awful lay down beside brimber[?] Teeth chattering in my head. No time for more notes. 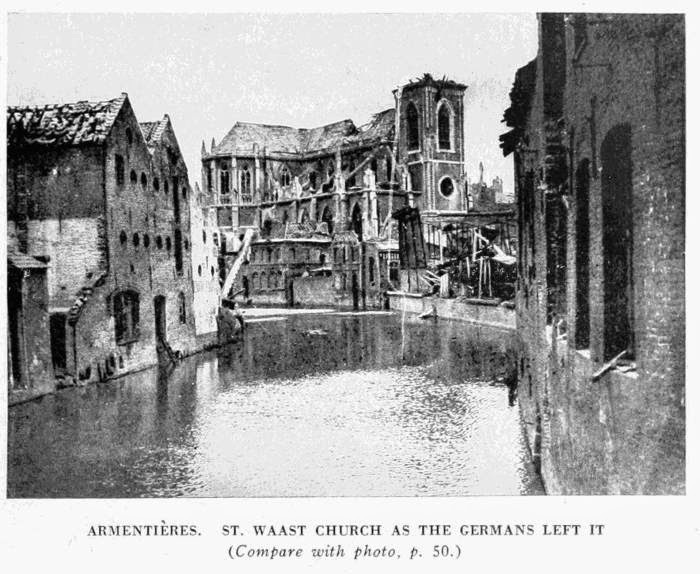 * For more information regarding this battle, see the opening pages of the Michelin Illustrated Guides to the Battlefields (1914-1918): Ypres and the Battle of Ypres (Michelin, 1919) here & scroll down to p. 49 onwards for photographs of the Church of St. Waast, Armentieres before & after the fighting (possibly the church he describes? ).